Where the heck have I been? Seriously, I want to know. 2013 seems to be flying by me in a high-speed blur. All I remember is that there an awful lot of nights spent in hotels, home cooked meals have been few and far between and, as you may have noticed, I’ve been a pretty pathetic Dorista. So thank goodness for make-up week, because boy, do I have some recipes to make up. This will be a small dent in my FFwD To Do list. First, do you still remember May? Back when we were all still happy about the slightest hint of warm weather and not complaining about the heat? 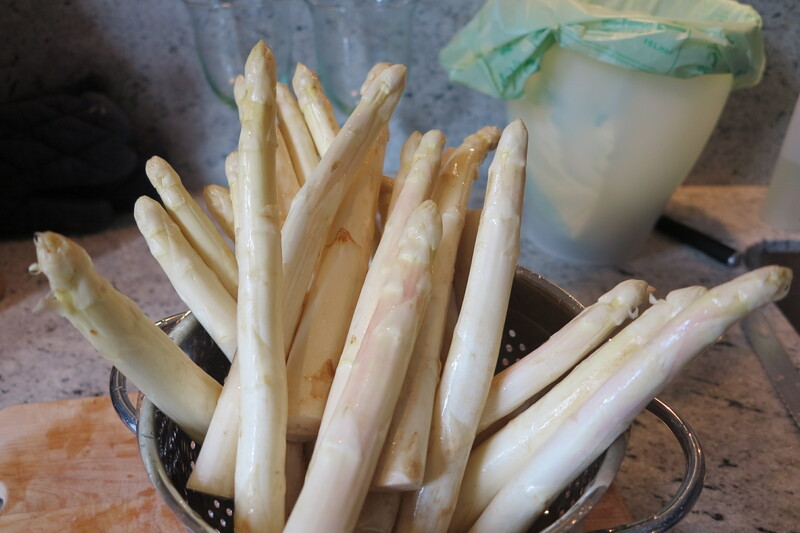 Back when asparagus was in season? 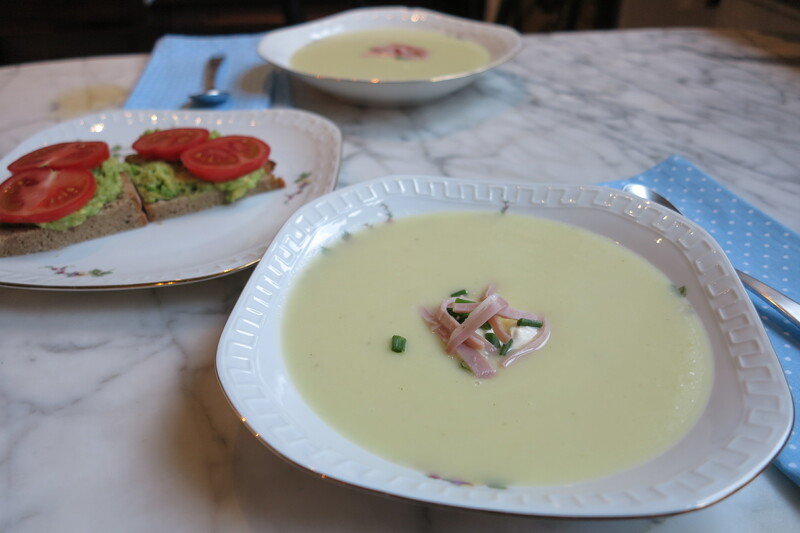 My memory is faint, but I have pictures on my computer of Asparagus Soup topped with creme fraiche, chives, and strips of ham, and I have a note in my book which reads, “yummy!”. So I guess that just about sums that up. Somewhere along the line I also made Dieter’s Tartine. Many Germans use the word Abendbrot for their evening meal, which literally translates as “evening bread”. In fact, Abendbrot is not at all uncommon in my house after a long day. In addition to Dorie’s original recipe, I also whipped up a few other favorites. I find that the key lies in a good quality loaf of bread. So long as I have good bread, even the most mundane toppings can work. Hopefully my schedule settles down soon and I can find more time to hang out in the kitchen. I’m missing it and my fellow Doristas. We miss you too ! But glad to see you back this week with these lovely offerings. I’d love to sit down and enjoy them with you! These are so pretty. The fancy tartine was just a revelation to me and is getting a lot of play this summer, that is for sure! I love the triple tartine! Hopefully we’ll see more of you soon. We do miss you, but life is like that sometimes.I love your platter of tartines. That’s a perfect summer dinner! Your tartines look so good! 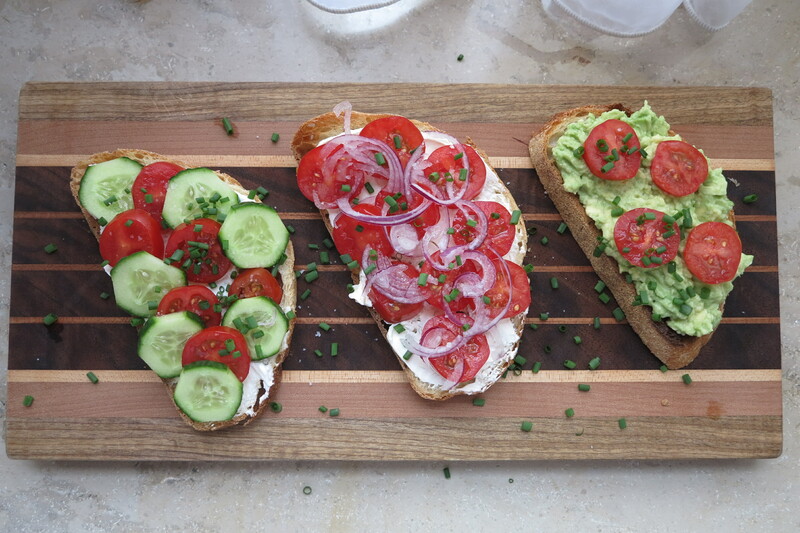 What is the green spread on the tartine on the right? chickpea flour, that sounds like a delicious way to use it up. Have a great weekend. Another pathetic Dorista checking in… I totally get what you are going through. Here’s to more chances to do more make up posts like this one! Your tartines are gorgeous – the one in the far right looks especially delicious. I’m also another pathetic Dorista checking in. Made lots of things, didn’t get around to posting, then it was just too late and you know how the story goes. Everything looks really fantastic – I just adored the Tartines and how easy they were, and the elegant presentation they make! Is year has flown by for many of us! I make things and don’t get the posting done. Sometimes I think I made something because I read everyone else’s posts then realize I never actually made it myself! I don’t see it getting any better so I’m trying to go with it. Good bread makes all the difference for…well, for anything that requires bread. haha. Your tartines look great! I haven’t done this one yet. Oy. We’ve missed you, too! Your tartines look wonderfully delicious…a perfect make up! !